The BEST Foam Fight EVER! The day after Raisin Sunday is Raisin Monday. Read the BLOG about RAISIN SUNDAY! After Raisin Sunday, Tiffany and I were exhausted. 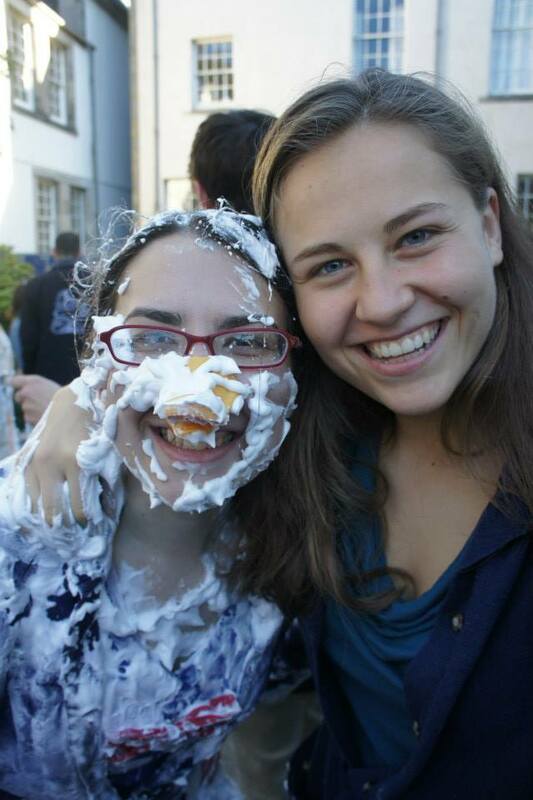 We were covered in paint, whipped cream, cheese puffs, and sand and we were ready to take a shower. We crawled into our beds and vowed that we would never move again. Unfortunately, we had to move again. The alarm clock rang on Monday morning. We rolled over and looked at each other. We knew that we were going to have to get out of bed, and neither of us wanted to do it. Once we did get up (an hour after the alarm rang, shockingly!) things got a whole lot better. The traditions for Raisin Monday are just as interesting for Raisin Sunday at St. Andrews. Every year on Raisin Monday morning, students go over to their mum’s house. The mum can then dress the children as WHATEVER SHE WANTS before sending them off to their dad’s house. The dad then gives them a “raisin receipt” which is usually the most ridiculous item he can think of. All of the dad’s children then carry the receipt off to St. Salvador’s quad, where they turn it in for entrance into a school wide massive foam fight..
Elisabeth dressed me as Donald Duck! Walking to the foam fight was hilarious! Mums dressed up their children as all sorts of things, we saw bees and flowers and monsters and babies wearing only a diaper. We saw one dad who dressed up as Aladdin and made all of his kids carry him along on a huge mattress through town. 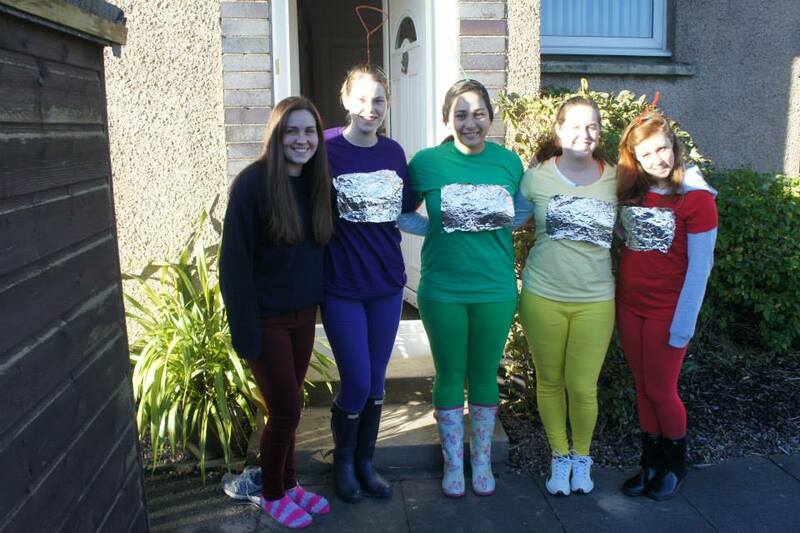 Most of the mums went ALL OUT on their costumes! Once we got to the foam fight, we got in the queue. My family was the FIRST FAMILY in line for the foam fight! I think that we must have skipped the queue to turn in our receipts, because I know lots of people had been waiting there a lot longer than we had! But when they opened the gates to let us in the quad for the foam fight, we were the first ones in!The foam fight was CRAZY! Imagine everyone you know at Uni running around in a quad wearing Halloween costumes. 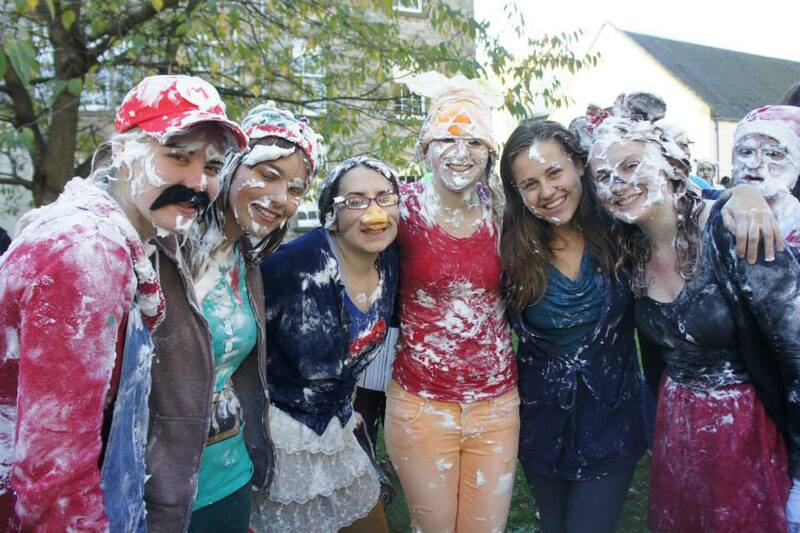 Then imagine that they all get out cans of shaving cream and start flinging it at each other. EVERYONE was covered in foam and attacking everyone and yelling and running and screaming! 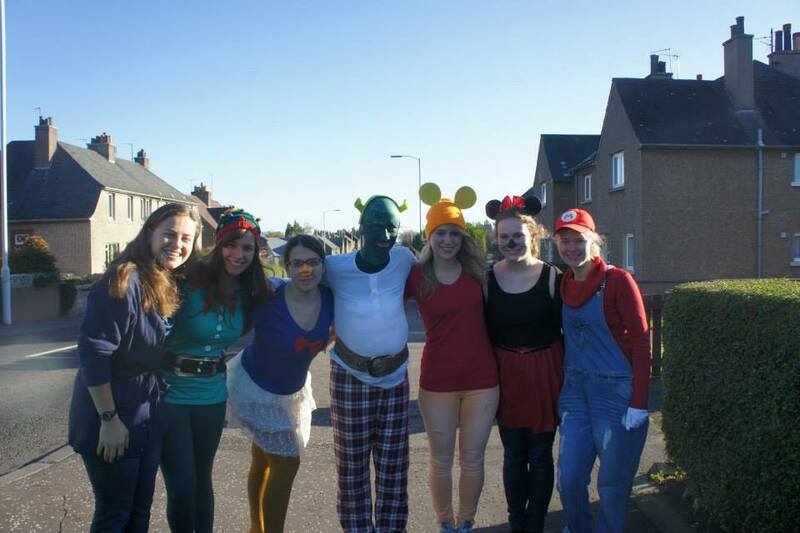 This is Scotland, so it was about -100 degrees outside, but it was absolutely hilarious! As my favourite form of procrastination is reminiscing about my semester abroad, and as my week contains multiple exams and major assignments, I think this is the perfect time to write some more about my time across the Pond. [Note: I do not condone excessive procrastination.] I believe I have yet to tell about my visit to Brussels so I will commence there. After saying goodbye to Anna in Frankfurt over Spring Break, Scott and I continued with our delightful first-class train ride to Brussels, Belgium. I thoroughly enjoyed this segment of the trip by sleeping the entire 4 or so hours: clearly, I am a delightful travelling companion. We arrived that night and were met by Cory, a friend from Melville (our residence hall in St Andrews). It was already dark outside but he showed us a bit of the city before heading to his house. Our first stop was to get Belgian waffles. Let me pause here. Belgian waffles. After a restful night’s sleep and breakfast–where we got to meet his family–we were off again to the city. And what a city! Aside from the fact that a wonderful friend and my academic dad are natives, it’s an amazing place. One of the first places we went was the Justitiepaleis, or Palace of Justice. It is called a palace for a reason. That monster of a building should make anyone afraid of breaking the law. The Royal Palace is probably smaller but lovely, and we spent some time walking around the park in front of it. Buckingham Palace was awesome, but this is nothing to scoff at either. I’m very grateful to my friends for indulging my Catholic-ness. When Cory asked us if there was anything in particular we wanted to see, I said Catholic cathedrals. He asked which one and, not knowing anything about Belgian cathedrals, told him to choose. I am happy in any cathedral. So off we went to Église Notre Dame du Sablon, or Cathedral of Our Lady of Sablon. I especially loved the way the chapels along the edge of the sanctuary were arranged in almost an open-air fashion, let alone being in a 15th-century cathedral filled with beautiful artwork and echoes of ancient hymns lingering in the rafters. There was also a marble alcove dedicated to two families with statues and crests all around, and a baptismal font in the middle. It was so still that I couldn’t help but feel solemn and reflective. I can’t resist! Organs are such beautiful instruments, and the lighting here is ethereal. Wow. That was a lot of photos in a row. I wish I could share them all! I also wish I could keep writing, but–alas–academics do come first. I will share more soon; until then, please say a prayer for all of the Erskine students tackling midterms these next couple of weeks. God bless and keep you! This Monday was the first day of classes here at the University of St. Andrews. As I have been waiting about 100 years for classes to start, I was quite excited. I went to bed early and I got up early (7:30 am). I took a shower, I dried my hair, and I agonized over what to wear. I packed my backpack. My class started at 9 am. 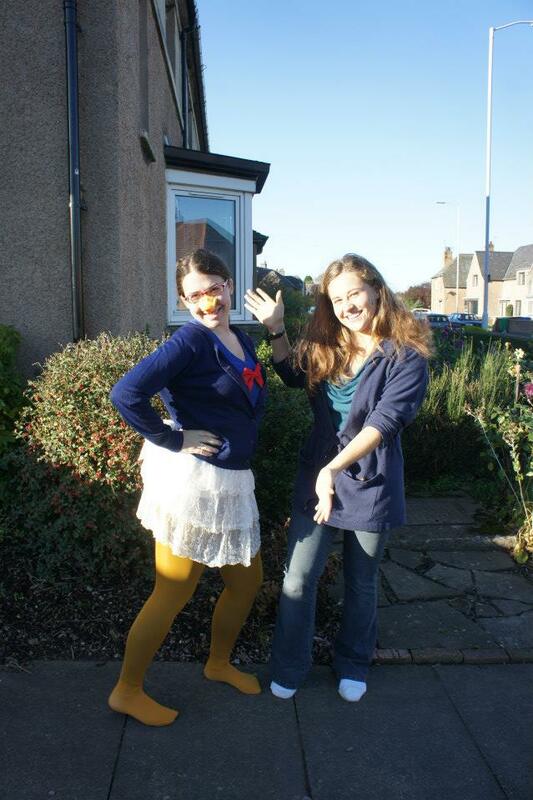 I arrived at 8:45 and waited for Elisabeth and Mairi to get there, and we walked inside. I sat in my seat and got out a sheet of paper to take notes. I opened a new pack of pencils. I was ready for my first day of school! And…… Class was over by 9:45. So that was pretty much the most anticlimactic first day of my entire life. I had about 45 minutes of lecture, and that was my only lecture for the day. However, don’t feel too bad for me! My professor realized that he would be missing several lectures during the 8th week of the semester, so he decided to schedule an extra two hour lecture on Friday afternoon. This was the first time that this has ever happened to me: at American Universities professors do not typically walk into class on the first day and announce that they will be holding extra lectures! It is actually quite a common thing here for students to have very little contact with their professors. Students might attend only 1-3 hours of lecture per class, per week and then be expected to do a large amount of reading and studying on their own. I have 3 classes that only meet once per week and this week so far all of the professors have let me leave early. On the plus side, we have a cleaning service here in my hall! No, I am not kidding!! Every morning someone comes in to take out our trash and once a week she comes in to vacuum the floor, clean the sink, and dust! At Erskine they always say to freshman “you better be neat, no one is going to clean up after you in college!” But here, someone actually does help us out a little bit! It is the strangest thing! If you hear someone talking about “tradition” in the States, it almost always comes with a negative connotation. At least in my experience it has. I am not sure if this comes from the fact that Americans want to be free from the rest of the world or if it is strangely left over from the protestant reformation or the popularity of the protestant church in the States, but people don’t really seem to value old traditions. Coming to St. Andrews has already taught me an entirely new meaning of the word. People here love tradition and there are plenty of opportunities to participate. Since being here I have already encountered many lovely traditions that I am very excited to participate in. Some of the traditions are quite random. They have one here called the Pier Walk. As far as I can tell, several Sundays per year students don their red gowns and meet at the pier to walk… on the pier. They start at one side of the pier and walk down and back. No one is entirely sure how this tradition originated, and yet almost everyone participates. St. Andrews also loves it, and takes hundreds of pictures for postcards and advertisements. I am very excited to participate in this tradition! 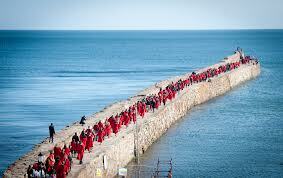 Students walking along the pier in their red robes! I promise this is my last post about Germany (for a long while, at least). Nothing against Germany. Au contraire: I adore Germany, but I think it is time for me to finally move on. So I conclude with a few more photos and stories of my day in Frankfurt with Anna. After the Cathedral, we went some place a bit different. Paulskirche (St Paul’s Church) was rebuilt after WWII and turned into a conference/meeting area and a museum of sorts. It was almost a little sad to me to see it not being used as a church any more, but I am very glad that they rebuilt it and that the building can still be used and appreciated. I also love the modern organ, which I feel is a nod to its history as a place of worship. I also think they did a great job fusing the old look with a modern facelift. Paulskirche (St Paul’s Church), built in 1790. This was the location of the first German National Assembly, where the first German Constitution was resolved (1848). It was rebuilt in 1948 following World War II. Anna and I each lit a candle here and spent a while praying. It was such a lovely, peaceful moment. The Lord is truly present in the still, quiet moments of life! A beautiful German prayer asking the Lord to be the light that we may walk by in the darkness of our lives. I thought it a bit odd that there was such modern art in such an ancient cathedral, but I was also greatly drawn to it. Now, I am normally not a huge fan of shopping (no, really). But Frankfurt has literally the coolest shopping mall I have ever seen in my entire life. The Zeilgalerie is 10 stories tall with a rooftop viewpoint where you can admire the city from above. the Zeilgalerie,by far the largest shopping centre I have ever seen. I felt like I was in the Jetson’s or something: I don’t think I have ever been in so modern-looking of a building.It also boasts a ridiculously tall escalator, 4 or 5 stories tall. Anna, bless her heart, is not fond of heights but rode it with me to the top! And then we had Chinese food. In Germany. Yep. Here is a collage of photos I took inside Zeilgalerie. Seriously. How cool is this? Just look. We also shopped around a bit and then went to the roof. THE ROOF. Frankfurt is gorgeous from every view, including above. I can find few words to say how fun it was to see, especially as the sun was beginning to set, so again I will let some pictures speak for me. I know I just had almost the exact same picture (with me), but the sky in this photo just blows me away. This picture is not edited at all: I snapped the picture at just the right moment when the sun was peeking through the clouds the perfect way. How gorgeous is God’s creation?! What a beautiful German church! It doesn’t look very big until you consider that those little ant-sized shapes on the ground are full size people. No visit of mine to a European city is complete without visiting the opera house. This was our last stop on the way back to the train station. Along the way we passed the largest book store I’ve ever seen. Frankfurt has a habit of impressing me. There was a university orientation activity going on, so we were around large groups of German freshers chanting and cheering and acting rather silly at times. I wish I spoke enough German to understand what they were saying, but I’m glad they were enjoying themselves. This is the largest book store I have ever seen in my life! I dearly wish we could have gone inside, but I would probably still be there if we had. Anna said that they have a massive selection of English books as well. 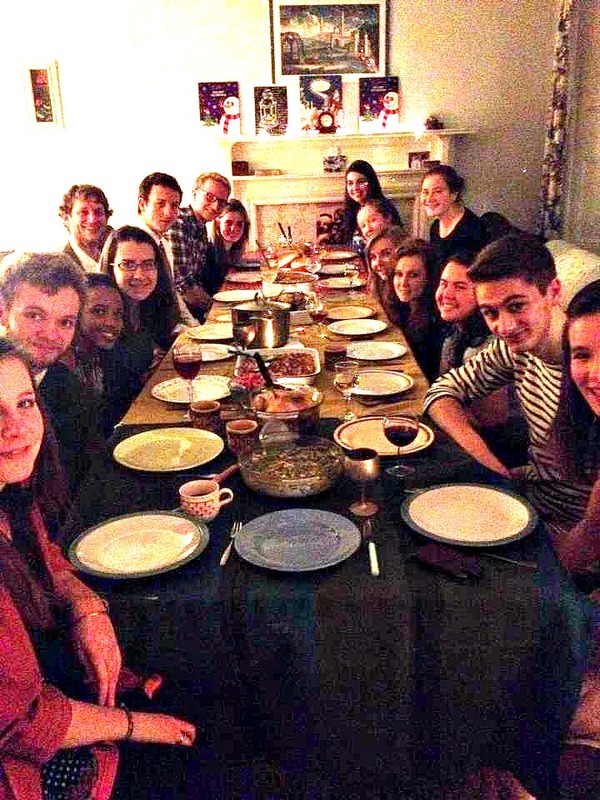 friends in Frankfurt, old and new! Out of all of my posts describing my spring holiday travels, I may be the most excited to write about this one. My favourite thing about memories is being able to share them with people, and I spent time with quite a few lovely people in Frankfurt. I mentioned in my last post that Scott & I stayed in a hostel (my first one ever!) for two nights: I could not have asked for a better place to stay! The hostel was quite close to the train station (which was very convenient for us) and from the moment we walked in I could tell I was going to like it. After storing our luggage, we went down to the common area for free crepes and to hang out. Over the course of the evening we talked to people from Canada, Mexico, Puerto Rico, the Philippines, Australia, and all over the United States and Europe. I really got to practice my Spanish, too: I had a great conversation with five native Spanish speakers from both sides of the Atlantic. Several of them were staying the second night as well so we got to talk more. Two of them were brothers from Spain, Miguel and Carlos, who gave me a small Miraculous Medal (inscription in Spanish) on the last night to remind me of our shared faith and our Holy Mother. Though I have several of my own, this one has special meaning to me and I wear it often. We talked with a couple of US Army guys and a Canadian firefighter, as well as a very sweet American man who moved to Europe after graduating high school and became a flight steward. He is still in Europe over a dozen years later and loves travelling. I also loved talking to the guy who was on night shift at the hostel: he was Australian, Catholic, and had dreadlocks and we got along quite well. There were many others but I do not want to bore you too much. I absolutely loved meeting everyone and hearing their stories: where they came from, what travels they had done so far, and where they were heading next. I am still in contact with several of them and it was truly a great experience. Who knew that a hostel stay could be such an adventure? Scott decided to spend our last day in Germany studying for a big exam he had after the holiday, so I spent the day exploring Frankfurt with Anna. I was originally going to visit another friend from high school who is stationed at the air force base nearby, but his work schedule didn’t allow any time for it so Anna agreed to come meet me. It was really nice to get to see her for a second day! She knows as much about Frankfurt as she does about Mainz: I learned a lot and had loads of fun in the process. I always thought of Frankfurt as an extremely urban area known mostly for banking and big business, but Anna showed me the old part of town which had so much charm and a lot of friendly small-town feeling. I will let the pictures do most of my talking: included are my usual collages, pictures of churches, pretty views, slightly cheesy poses, and the mandatory opera house shot. The old square in Frankfurt. I couldn’t decide where to focus my attention! It was quintessentially German and I loved every bit of it. Of all of the beautiful buildings and sights in the old square, this teddy bear store is what caught my eye. Go figure. The sign around his neck says that you can’t touch him, which is just torture. What child (including adults who still act like children..ahem..) would not want to hug this? So I gave him an air hug. After getting to the old section and wandering around for a bit, Anna took me to Eiserner Steg, the Iron Bridge, over the River Main. What an incredible bridge! It is over 100 years old and strictly for pedestrians. The ancient Greek inscription overhead is a line from the Odyssey and means something like “while crossing the wine-dark sea to men of strange speech.” That is an awkward translation of a phrase that describes the way that people of all civilisations have crossed bodies of water to find people of other languages & cultures. I read that they chose this saying to represent the diversity of Frankfurt. I would have loved another day in Frankfurt to explore the part of the city across the bridge; perhaps another day! I love that there was a man playing an accordion on the corner: it seemed so appropriate! And I loved seeing the love locks along the edge, a common theme on my trip. We next went to see Alte Nikolaikirche, the Old St. Nicholas Church. It was lovely! We then visited the Kaiserdom Sankt Bartholomäus, or Cathedral of St. Bartholomew. What a building! I was unable to fit the entire building into one shot, so I will regale you with photos of the inside instead. Construction began in the 14th century. I apologise if I have sounded repetitive in my posts when I talk about churches and cathedrals: I find words difficult when it comes to describing both the structures and the feeling of actually being inside. We walked through this cool courtyard on our way to the Cathedral. I felt like I was participating in a piece of modern artwork.